Ready for a fast-casual barbecue restaurant that generates great profits and is easy to operate? It's simple, we want to find the right Owner/Operator first. Second, we use our site selection model to find the right location. Then we assist every step of the way in building a great restaurant and setting our operators up for success. Dickey's has evolved over the years, changing the public's perception of barbecue and taking the category mainstream. 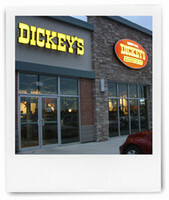 The Dickey's restaurant concept is clean, bright, inviting and well-planned. We aim for 1,400 to 2,400 sq. ft. in-line or end-cap locations to maximize the profitability of our stores.